A very belated Happy Christmas and a nearly belated very best wishes for a very happy and peaceful 2018. A huge thankyou to all for your custom and friendliness during the past year. It has been a tricky one for us as our lease was again up for renewal with HS2 but I’m pleased and relieved that we now nearly have an agreement for another two years albeit with a six month break clause, just in case they decide they want to knock the farm down! Apologies though as, for some strange reason, I have managed to neglect the news, views and interviews bit of the website. Busy days, long days followed by short days and the things of stuff has meant that I don’t seem to have found any time outside of updating the information side of the site in recent months. Amongst my New Year resolutions is to ensure we update the less irrelevant bits of the site much more regularily! We’ll have to have a meeting and get a roadmap drawn up, or not! Dark December is all but gone and we are about to embark on Jubilant January. Sad news in that just before Christmas Norman Apsey passed away peacefully on December 22nd. Norman was a good friend to us and many of you I’m certain. Very kind and enthusiastic about everything, including balloons, he will be sadly missed. Our sincere condolences go out to his missus Audrey his family and friends. 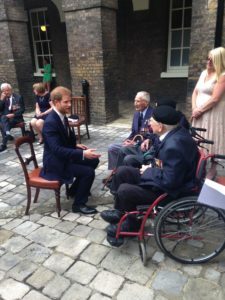 On a happier note, since the release of ‘Dunkirk’ Jane’s dad Edward (97) has found himself off here, there and everywhere including Leicester Square for the Premiere of 'Dunkirk' and even feted by Prince Harry. He is also doing book signings and got a presented with a huge hamper at the British Legion by the RAF Supply Officers Training, Unit presumably in recognition of the stuff he filched whilst sorting stores in the RAOC! Makes you think! Anyway more of that to come when we get everything together. Jane’s dog Roxy goes from good to confused Donegal. Its clearly going to take a while to sort her head but she is really rather sweet, albeit inclined to take off at 60mph and able to clear an eight foot fence. Our garden fence now an improvement on the lion enclosure at Whipsnade Zoo. She now escapes out the front door. Sadly she did manage to paralyse herself falling down the stairs but following a rather costly stay at the Royal Vet’nary College she has recovered quite well although occasionally the nearside rear leg goes a bit awol and she falls over, especially in tight turns. Her jumping ability is sadly returning.Our walking jollies have gone on unabated with only a few days missed. We had a very impressive dump of snow and somewhat stupidly I decided a walk in the hills would be a good idea. Bad idea, as I chose to walk a lump of the Ridgeway up from the village. Most of the way was blocked by downed snow-laden fronds and ivy coated trees. By the time I got to the top it was dark and by the time I reached Wendover again it was decidedly dark and over three and a quarter hours later for a jaunt that normally takes a couple of hours tops. 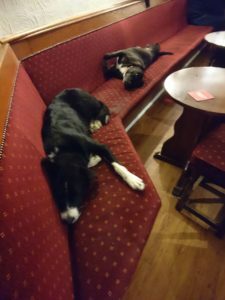 To make up for it yesterday we did a pub to pub from The Lions at Bledlow to the Swan in glorious sunshine with crunchy frozen ground underfoot accompanied by, long-distance-just-back-from-Nepal, Godfrey who missed his sherpas but provided a gin and plum elixir. Hopefully, and if the weather goes to plan, coming up shortly after this is posted will be the long-in-preparation article on Tony the Train and my day out courtesy of Chiltern Railways and an abridged version of our epic Ridgeway walk. Lurking as well will be an article on the sadness of the Restoration Man courtesy of Steve Roake. There are now quite a few folders on me screen awaiting completing so I’m aiming to do one a week for a while. In the extended news is a load of technical stuff that has been accruing over the past few months some relating to revisions of revised revisions. There should also be a bit on mushrooms, the sad loss of Ray Hunt whose funeral drew a full house which would have ensured his enduring smile just got a bit broader. Any one that decides that their departure music should be ‘The Laughing Policeman’ gets my approval. Nearly forgot again to add under the Steve Roake column that he has gone into merchandising hopper stuff presumably to support the purchase of stainless steel nuts and bolts. 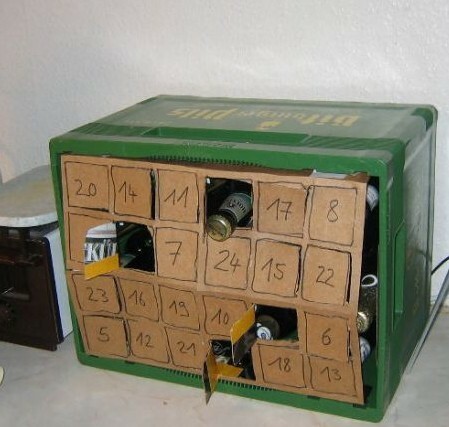 Apologies we didn’t this out in time for Christmas but everyone has a birthday! We'll put it on the 'Items For Sale' page. Also up should be a bit on the Distinguished Gentleman’s Ride from two viewpoints. This year it was dry and in the end I took the Bonnie, which had its moments! There is a link in The Great British Long Jump report to Chris Wood’s video of his 'epic' solo, in every sense of the word, Long Jump. Now if that doesn’t inspire you nothing will. The British Balloon & Airship club (BBAc) continue to beaver away at EASA stuff and have reported on a number of occasions on what may or may not happen. Frustratingly for everyone concerned, everytime target dates are set, EASA postpone them. Their roadmap must be well out of date now! Best move on lest there will be me telling you not to bother to read it! Across the yard the Dark Barn, deeply dark in winter, underwent a clear up but I’m pleased to inform you that it is all now full of stuff again! Finally after a year or two we dragged the rather impressive bike lift down form the loft and guess what? It is covered in stuff already. On the domestic front the pickup, just shy of 300,000 miles developed a bit of a running problem, ran OK but needed a bit of warming up before driving. Once running it was pretty faultless but had the occasional hiccup. We checked the pump timing and valve clearances and drew a blank. Apart from the fuel pump the engine is untouched so we decided to treat her to a head removal, like you do. Sadly it transpired that although the headgasket was fine the valves all nice and the bores remarkably unworn the head to number three cylinder was poorly beyond repair. Seems there had been a steady ingress of water probably via the pre-combustion chamber that had eroded the metal around the valves and taken out a chunk of the bore. Quite why it ran so well is a mystery but does explain why they are so sought after! A new (secondhand) engine is being sourced but in the meantime we’ve been trying to find a replacement which eventually we did but I must have had one of those blind deaf stupid moments so it will be going as soon as the old faithful is mended. Just to add insult to injury Alice’s Astra threw its alternator out the pram so new bracketry required and then the £100 balloon Corsa starter fell out. Fortunately the old multi-coloured one hadn’t gone to the scrappie so a quick fiddle with the spanners and its running as sweet as once more. That will do for the moment. Just to say thanks again for 2017 and here’s to a grand 2018. Nearly forgot. The champagne cork in the last News belonged to Rob Fuller of course. Main piccie is Jane’s dad Edward Oates (in the foreground wheels) chatting to Prince Harry. 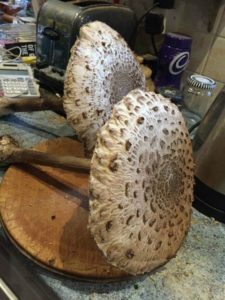 The middle pic is the best advent calendar we’ve ever seen courtesy of Steve Burden along with some rather nice mushrooms awaiting eating. And finally Polly and a fellow local, Piglet, demonstrating that The Swan is dog-friendly. Thanks for dropping by, all me best Chris, John, Jane, Polly and Roxy.